The 3 types of muscle tissue are cardiac, smooth, and skeletal. Cardiac muscle cells are located in the walls of the heart, appear striated, and are under involuntary control. Smooth muscle fibers are located in walls of hollow visceral organs, except the heart, appear spindle-shaped, and are also under involuntary control. 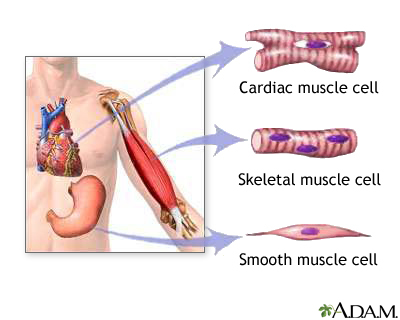 Skeletal muscle fibers occur in muscles which are attached to the skeleton. They are striated in appearance and are under voluntary control.